How many pencils can fit in one pocket?! What a great day for a project! 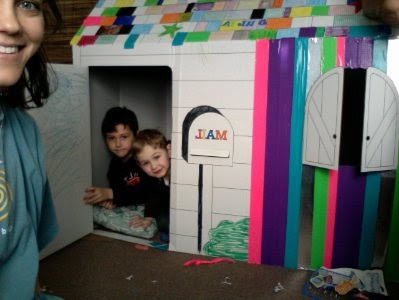 Someone gave Gray this house for Christmas- I instantly knew we'd love it. Automatic fort! Today we decided it was time to put it up and decorate it, we had some extra company, my neighbor Jay and his daughter Julia and adorable Noah and Gray of course. So this is the house "before". Julia reminds me of me here- anyone else think so? Here's some of the finished product. I actually wove the duct tape on the door, including a duct tape kick plate that you can't actually see. The kids had so much fun putting their own special touches on the house. And bonus, this activity involved all of us, having fun together, for the entire afternoon. No tv, no video games, and tons of laughter. We didn't even finish half the house. LOL It was Me... your sister who gave him that house, not just someone... Im so glad he is enjoying it. Ha! I didn't understand where probably 90% of his gifts came from. Of course he didn't read any labels as he was ripping stuff apart. 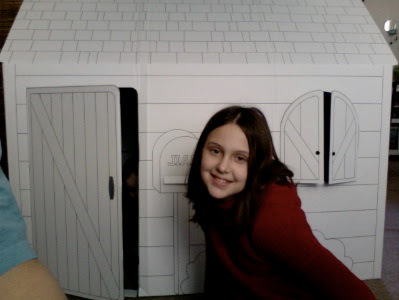 This play house is enormous, but so much fun!! 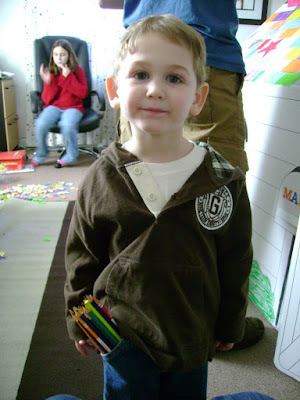 Now we know Noah needs bigger pockets, next birthday. Too cute. What a great gift that was, Sister! 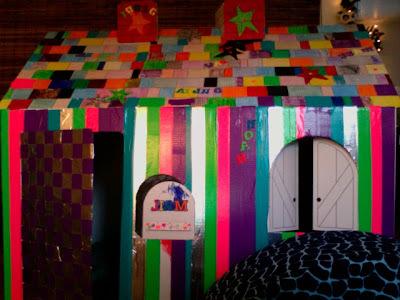 That house looks great, sounds like lots of fun,- did the kiddos actually color any of it [looks like maybe the inside of the door?] - or so far, is it all duct taped? Looks swell, happy you had a good time. The kids did a lot of the sides and roof and yes, the inside. 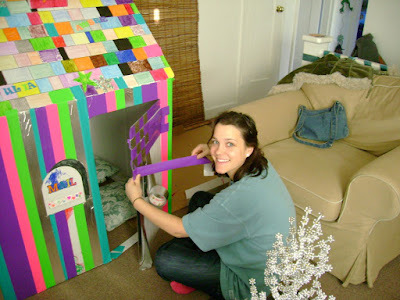 We're not finished yet, I'm thinking of more duct tape weaving, effectively turning this biodegradable green toy into a rental unit in the back yard. Any takers? So how come you knew I was the one who gave him the whoopie cushion????? Since this is from Anonymous, I still don't know who it was for sure. Name yourself!